The day after Thanksgiving, when we should have been battling crowds for a deeply discounted flat screen TV, or at least picketing such, we instead joined our neighbor Bob for a day trip through the Pinto Mountains in Wonder Valley. The photo below is looking from the road that leads to the Pintos toward Sheep Hole Pass across the valley. The horizontal whitish stripe in the middle is the old dry lake and the salt works. 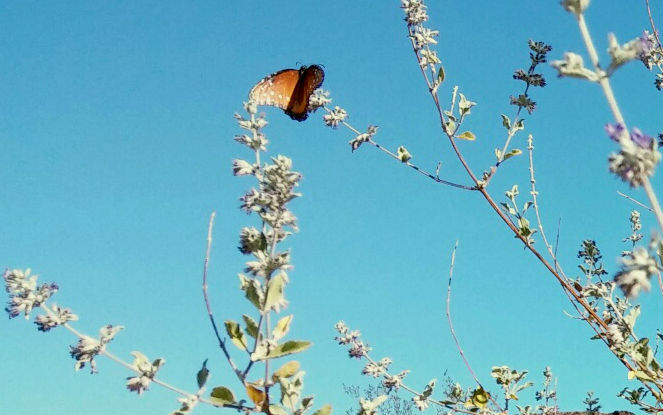 It was a beautiful day, high 70s/low 80s, sunny. 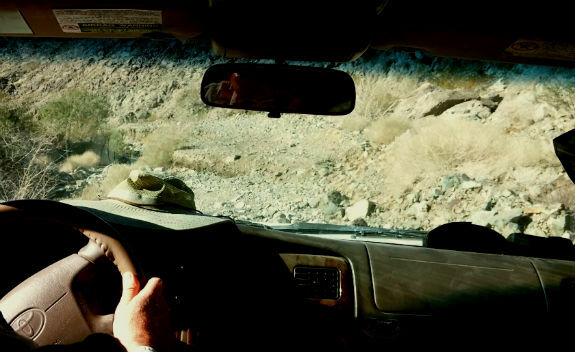 Bob's truck was equipped for the roads and he was a careful and experienced driver. At times I was certain we would become stuck and once we all got out to see how deep a washed out road was and to determine if the truck could make it. It did. 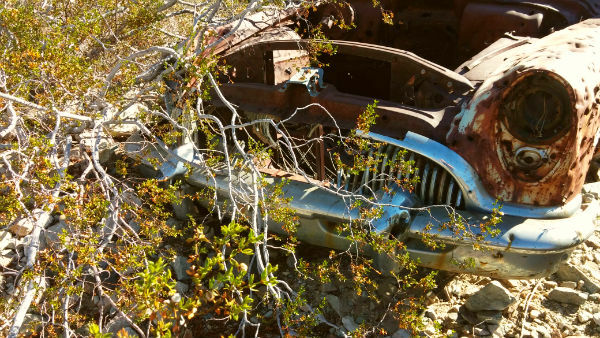 After visiting the abandoned iron mine on Iron Age Road, and an old abandoned gold mine after that, we drove to a wash marked with an old bullet-ridden Buick. (Find the Buick in Google maps.) We stopped and had turkey sandwiches left over from the previous day's dinner. 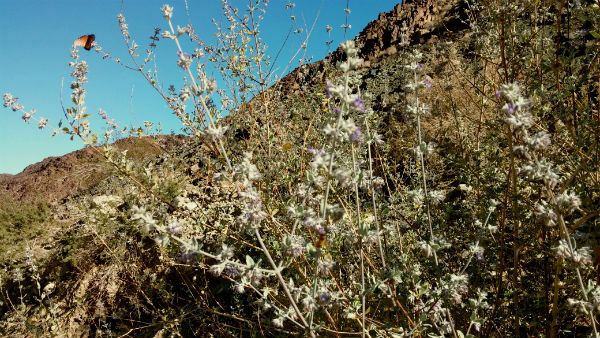 The wash was filled with desert lavender (Hyptis emoryi) which was courted by countless bees and butterflies - brush footed queens (see inset). The mines were horrible. New mountains of tailings and "overburden" were created next to the pits. "Prospects," trial mines, dotted the mountains and washes. At one point in the past it seemed that anyone could go into these mountains and destroy to their heart's content in an effort to squeeze out a little ore to make a living. The first mine above is the iron mine. That's not a canyon, it's a mine. The second is thought to be a gold mine. The green arrow points to a full grown tree at the bottom. 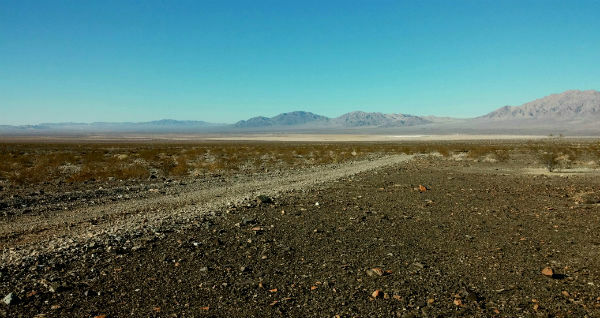 As remote as this road was the scars of man's presence were everywhere: broken glass, garbage, ATV tracks, abandoned garbage dumps, alongside all the damage done by mining. At the same time it was quiet and peaceful and I could imagine spending the night out there in a leave-no-trace sense. It was a wonderful trip and I had finally ventured into the Pintos. I'd spent months watching them from our driveway and was absolutely delighted to get to broach the horizon and drive around among them.